Rite at Home is a platform that guides the dying and their families through the process of preparing for a home funeral. By connecting users to support and providing step-by-step guidance, the platform creates a more meaningful and intimate end-of-life and funeral experience. For this conceptual project, we were asked to examine the funeral industry, research new trends, and propose an alternative end-of-life practice. I attended several funerals last year that shaped my perspective on this project, but I was most significantly impacted by helping a close friend plan her mother’s funeral this year. The process, from start to finish, was unnecessarily complicated, expensive, confusing, and impersonal. What troubled me the most was that the funeral in no way supported my friend in working through her grief and processing this immense loss. I approached the project with this experience in mind. My goal was to create a more supportive service in response to the biggest issues in modern funeral practices. My solution is Rite at Home, a platform that guides the dying and their families through the process of preparing for a home funeral. By connecting users to support and providing step-by-step guidance, the platform creates a more meaningful and intimate end-of-life and funeral experience. The subject matter for this project presented some significant challenges. Unsurprisingly, many people are deeply uncomfortable discussing death and the idea of their own funeral. 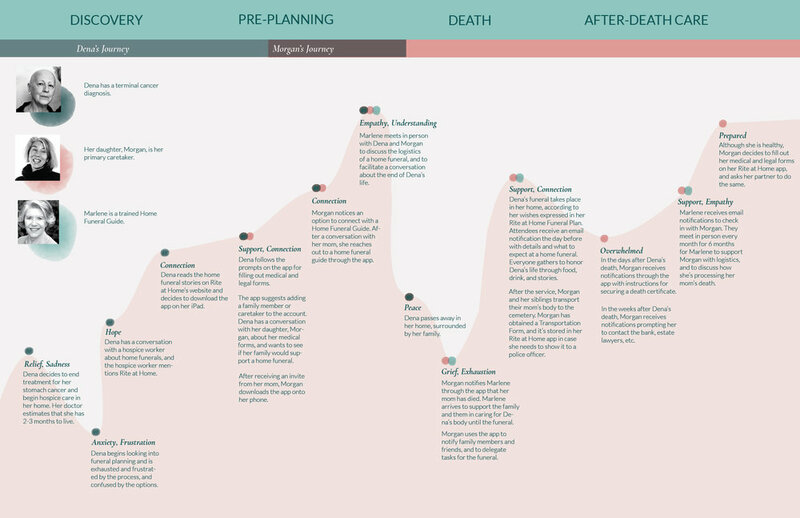 One of the biggest challenges to navigate was framing the project in a way that was approachable, nonthreatening, and didn’t immediately isolate audiences who have a hard time discussing death and funerals. I began this process with extensive research. I dug into current practices in the industry to identify which elements of a funeral cause the most pain and anxiety. I also conducted informal interviews with family and friends ranging in age from 25 to 65. Through my research, I encountered a tradition that solves for many of the most troublesome problems with the funeral industry today—the home funeral. Home funerals are a very old practice that are being given new life as people have become more and more dissatisfied with the funeral industry. While there are great resources available online for planning a home funeral, they are scattered and incomplete, with no one place to go for all the information and emotional support you need. Seeing how much value this tradition could add to people’s lives, I wanted to create a platform that made all this information available in one place. As a conceptual model for how this platform could be successful, I turned to home birth. Home birth is the oldest and most traditional way to give birth, then became the territory of alternative medicine as giving birth in hospitals became the norm. But now, home birth is once again a commonly-accepted practice, and viewed as a more intimate but perfectly safe alternative to giving birth in a hospital. I looked at the systems that are in place to support home birth, and why it appeals to people—one of the elements that makes home birth appealing is the way in which it connects those giving birth with both the person who supports them as well as a trained professional. I focused on creating an ecosystem that brings together multiple users to offer emotional and logistical support to the person planning the funeral. An important element of this support is technology that is simple and approachable. The app guides users through a questionnaire to determine the level of support needed, and offers several prompts throughout the process to add additional users to the account. The app then walks users through the process of planning a funeral, with specific prompts and reminders to fill in essential paperwork like an Advance Directive. Several well-being check-in’s are also included in the task flow.